Chamaedorea costaricana, common names: Costa Rica Palm, Bamboo Palm, Dwarf Palm is a moderate-sized palm that forms dense clusters of thin, green, cane-like stems that can reach up to 20 ft. tall but usually stay closer to 6 feet. 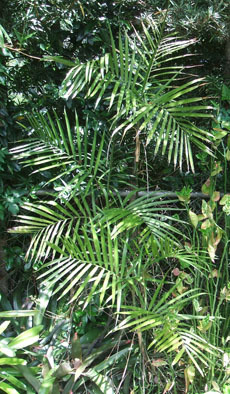 It has many dark, glossy green, pinnate leaves similar to the more commonly seen bamboo palm, Chamadorea seifrizii, but it grows larger, with longer leaves. It is native to rainforests from Panama north to Costa Rica, Honduras and Guatemala where it grows from a tropical 2000 ft. to a much chillier altitude at 7500 ft.. In cultivation it does well in the tropics as well as in most warm temperate areas where it has no trouble with an occasional light freeze. It also does exceedingly well indoors as a house plant where it easily handles low humidity and low light.